Milestone reached in restoration of 16th century National Civil War Centre building! 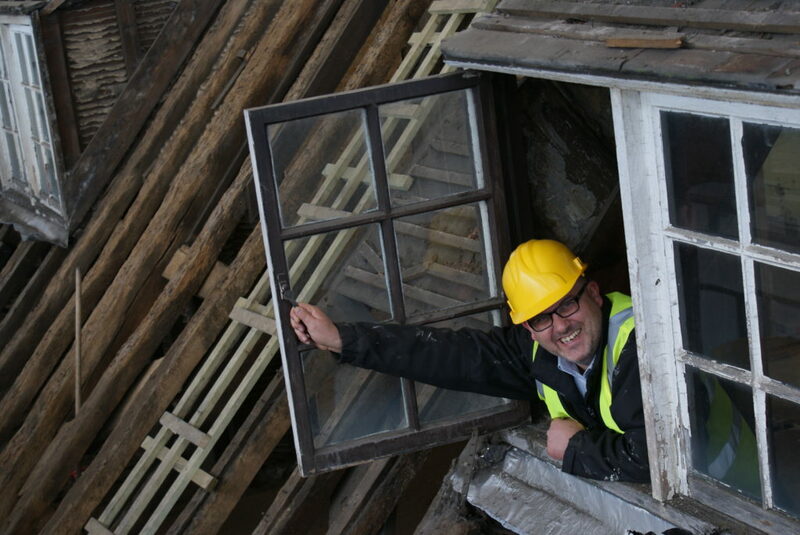 Oak beams dating to the Tudor period will be revealed for the first time in decades as work to restore the Grade II* Old Magnus Building in Newark, Nottinghamshire, reaches a crucial stage. The building – built in 1529 as a free grammar school and whose old boys include a distant ancestor of Walt Disney – will become home to the UK’s first National Civil War Centre when it opens next year. The £5.4m project by Newark and Sherwood District Council has been supported by £3.5m from the Heritage Lottery Fund (HLF). It will tell the story of Britain’s epic 17th century civil wars, while boosting the regional economy. The council is working with the HLF, Woodhead Heritage, a specialist team of Robert Woodhead Ltd, based in Edwinstowe, Nottinghamshire, and architects Purcell to transform the building into a 21st century museum and visitor centre. The Old Magnus Building comprises a Tudor hall, Georgian town house and Victorian school room and since last November experts have been carefully ‘unpicking’ the fabric – stripping back floors, walls and ceilings. This has paved the way for the main phase of restoration work to start. Roof tiles have now been carefully removed allowing the original oak beams to be inspected and scaffolding has given engineers access to a massive ornate Tudor chimney stack built in the time of Henry VIII. 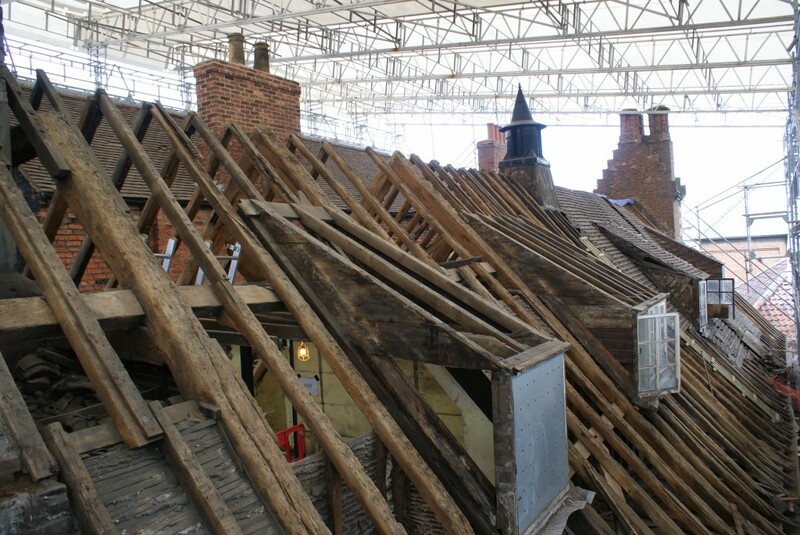 Roof tiles in good condition will be re-used, while English oak will be employed where beams need repairing. Elsewhere, new floors are being laid, a staircase remodelled and modern galleries, reception area and gift shop created. “This is an exciting project for us and, as with all our conservation projects, we are using traditional skills throughout. Where re-pointing is required a lime mortar mix is being used similar to that employed 500 years ago, while timeless carpentry and brickwork skills are also being extensively used. One of the Woodhead Heritage apprentices is Chris Richards, 18, from Sutton in Ashfield, training to become a joiner. He has already worked on another of the company’s projects at Lincoln Castle and is combining on-the-job training with studies at West Notts College. According to national surveys such skills are in short supply and the existing workforce is ageing making it vital young craftspeople are trained. A major challenge for project chiefs is the conservation of graffiti dating back to the 1600s. Carved into plaster walls by ‘naughty’ school-boys in the former Tudor school dormitory, the names include an ‘R Disney’ (1608) – thought to be an ancestor of Walt Disney of movie making fame, and ‘W Darwin’, cousin of evolutionist Charles Darwin, author of “Origin of Species”. The National Civil War Centre will open early next year and is expected to attract 60,000 visitors annually. Restoration work will continue throughout the summer.